What is the Khalistan Movement, and why does it want a separate nation? International Business Times, India, takes a look at what led to the beginning of the movement, and how it played out. The issue of Khalistan has returned to prominence with the fleeing from jail and subsequent recapture of Khalistan Liberation Force (KLF) chief Harminder Singh Mintoo. But what is the Khalistan movement, and why is there a demand for a separate nation? International Business Times, India, takes a look at what led to the beginning of the movement, and how it played out. Ever since their religion was founded, Sikhs have lived in the northern parts of the Indian subcontinent — in parts of modern-day India and Pakistan — but never as a majority religion. Thus, when the erstwhile state of Punjab was divided between India and Pakistan during the Partition in 1947, most Sikhs moved to India fearing they would be discriminated against by the Pakistani government on the basis of their religion. However, even in India, they claimed to face similar discrimination. Interestingly, one of the more renowned of such cases — when an Indian Civil Services officer named Kapur alleged that then Prime Minister Jawaharlal Nehru had in a memo told all states not to hire Sikhs because they were a "criminal tribe" — was dismissed as a hoax by the colleagues of the accuser. The Akali Dal, formed in 1920, began demanding a separate state for Sikhs after the independence. However, to give the impression that they were not asking for a separate state based on religion, they urged the government for a state where the majority of people spoke Punjabi. Punjab at that time consisted of the Indian side of undivided Punjab, the whole of Haryana, Chandigarh and parts of Himachal Pradesh. However, creating a Punjab state based on linguistics meant the state would have a 60 percent Sikh population, which the then Central government did not go ahead with at the time. A separate Punjab state came around only in 1966, but Sikhs continued to face what they perceived as affronts. One big issue was river water. As part of the Punjab Reorganisation Act and later legislation, Hindu-majority Haryana got a share in the waters of the Ravi river, but nothing was allocated to Punjab from the Yamuna. Even before Punjab became a state, Sikhs were arrested for protests, and the police, on one occasion, threw tear gas into the holy waters of the Harmandir Sahib — better known as the Golden Temple in Amritsar. The latter incident was viewed as a desecration by the Sikhs. The proponent of the movement for a separate country called Khalistan for Sikhs was one Jagjit Singh Chauhan. His demand came even as the Akali Dal was fighting for better facilities for Sikhs within India. The term had been coined in early 1940 by one Dr Vir Singh Bhatti, who had based his vision for the country on the ideas of Komagata Maru-fame Baba Gurdit Singh. Chauhan rallied for a separate Khalistan in Pakistan and the United Kingdom from 1971, leading to around three decades of militancy and unrest in Punjab that would leave the state as well as the country scarred. 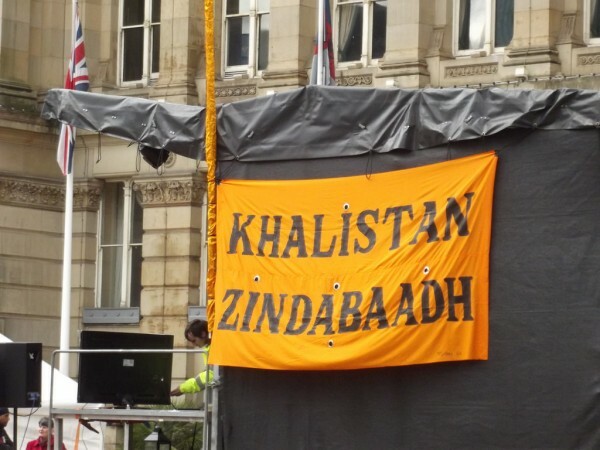 Chauhan went on to establish the Khalistan National Council in the UK in 1977 and operated from a building which came to be called the Khalistan House. He also went on to declare himself the "president" of Khalistan, formed a Cabinet, and issued passports and currency bearing the name of the non-existent country in an effort to legitimise it through official recognition from some or the other party. Jarnail Singh Bhindranwale started out as a religious leader who Indira Gandhi used to split the Akali Dal vote in Punjab so that her Congress (I) could gain a foothold in the state. His acquittal of all charges in the murder of the Hindu owner of a newspaper is often seen as the true beginning of the Khalistani movement in India. The Akali Dal joined hands with him after that and launched the Dharam Yudh Morcha in Punjab on the platform of the 1973 Anandpur Sahib resolution, with which it planned to get more rights and better treatment for Sikhs. Although Indira Gandhi saw the resolution as secessionist, the Akali Dal would go on record to say it recognised Sikhs as Indians, and that there was no plan or intention to secede. Bhindranwale first began living in the complexes of the Golden Temple in 1982, with around 200 armed followers. Their numbers only increased in 1983. He even went on to fortify the complex and extended his clout to the temple by overruling the head priest using his political connections. A day after Punjab Police Deputy Inspector General AS Atwal was shot dead while leaving the Golden Temple in 1983, then Akali Dal chief Harchand Singh Longowal — whom Bhindranwale had seen as a friend and collaborator — named the Khalistani movement leader in the case. With the Harmandir Sahib entirely fortified, Indira Gandhi first asked the Army to prepare a plan to attack the shrine to eliminate Bhindranwale, but was snubbed. The vice-chief of the Army who snubbed Indira was replaced by the person who would go on to execute what is known today as Operation Blue Star. Official figures say nearly 500 people were killed and 86 were injured in the Army's attack and subsequent storming of the temple complex that still had civilians in it, with close to 1,600 unaccounted for. Later that year, two Sikh bodyguards of Indira Gandhi would assassinate her in her own home in Delhi in revenge. That would, in turn, trigger the anti-Sikh riots of 1984, in which several Congress leaders would be accused of instigating the crowds to kill Sikhs. Indira's son and future prime minister Rajiv Gandhi would (in)famously be caught on camera telling a crowd that the earth shakes every time a big tree falls — a statement often seen as a form of justification being proffered by him for the riots that led to the death of around 2,800 Sikhs [by government estimate]. Subsequent years would see growing numbers of cases of militancy in Punjab in the name of a separate Khalistan. These included a number of attacks on buses and trains that would lead to dozens of deaths. Probably the biggest of these attacks came in 1995 when Khalistani militants killed Punjab Chief Minister Beant Singh. The period also saw the rise of multiple militant and armed outfits supporting the Khalistan movement. Another big one was from a decade earlier, when a member of the Babbar Khalsa blew up an Air India flight mid-air, killing 329 people. However, militancy saw a drop in the late 1990s and had all but disappeared by the turn of the millennium. What seems to have pacified the people even more is the conviction of several members of the security forces who had been accused of human rights violations — including rapes and fake encounters — in the militancy years of Khalistan. The Khalistan movement is now barely militant, with many believing that it has petered out.